The school's opening ceremony brought together families, village elders, and guests who all celebrated the knowledge and amazing opportunities offered by the new school. "It's all about joining forces for a better future for these kids," said Jochen Berger, Managing Director of the Acronis Foundation. 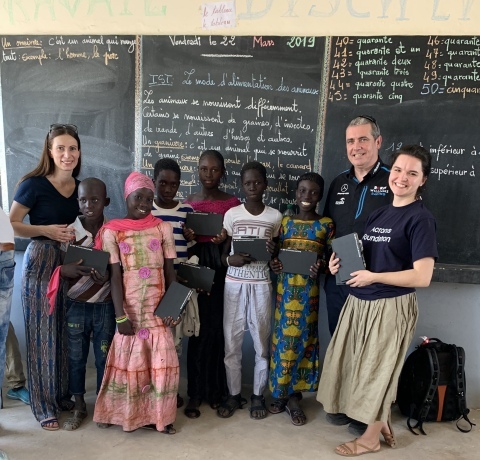 "Acronis and its partners from around the world are bringing not only hope but the actual means for local boys and girls to have access to knowledge, empowering them to follow their dreams." With help from its high-profile sports partners ROKiT Williams Racing Formula One team and Arsenal Football Club, the Acronis Foundation provided educational supplies, shirts, and footballs - promoting health and physical education to help make the school work fun. "We are proud to support the Acronis Foundation by raising awareness and donating team memorabilia for their fundraising activities. It is an unforgettable experience to see the joy in the eyes of boys and girls, so willing to learn," said Graeme Hackland, CIO of ROKiT Williams Racing Formula One team who attended the opening ceremony. "It is always a privilege to support local communities and children who love football," said Arsenal's Communications & Community Affairs Director, Mark Gonnella. "We believe that football has the power to inspire young people and teach them valuable life skills, such as team work and respect. These are transferable nto other aspects of their lives and can help them to unlock their true potential." "We do empowerment. It's not just the schools we're building. We work with communities to break the cycle of poverty. Every school is a great investment in the children and communities that we support. Building a new school in this community has the potential to change lives," said Maurice Muchene, Vice President of Business Development at buildOn. The Acronis Foundation was established by Acronis in 2018 in honor of Acronis' 15-year anniversary and the company's founding principle that all evils are caused by insufficient knowledge. The Foundation supports multiple initiatives around the world designed to stimulate education in order to gain and protect knowledge. Acronis Foundation has been creating and sharing knowledge by funding schools, research, and training programs in communities around the world. buildOn's mission is to break the cycle of poverty, illiteracy and low expectations through service and education. Across the global buildOn empowers people to transform their neighborhoods through intensive community service and to change the world by building schools in some of the economically poorest countries in the world. Since 1991, buildOn volunteers have contributed more than 2.2 million hours of service and constructed nearly 1,500 schools worldwide. More than 197,000 children and adults attend these schools every day. For more information, visit www.buildon.org buildOn has a 4-star rating from Charity Navigator.